The “pop-up” has become a catchphrase phenomenon among daring entrepreneurs in recent years. From a pop-up cinema on the top deck of a parking garage, to roving pop-up restaurants that inhabit nightclubs, to pop-up art galleries that mount works in warehouses, these impermanent businesses bring vitality to surprising settings. In spring 2018, NOMA embarked upon its own pop-up, a museum housed in a customized fold-out trailer that goes by the name NOMA+ (Plus). This bold new project, years in the making, brought many creative forces together to build and activate a “museum without walls,” one that will literally pop up in sites across metro New Orleans. 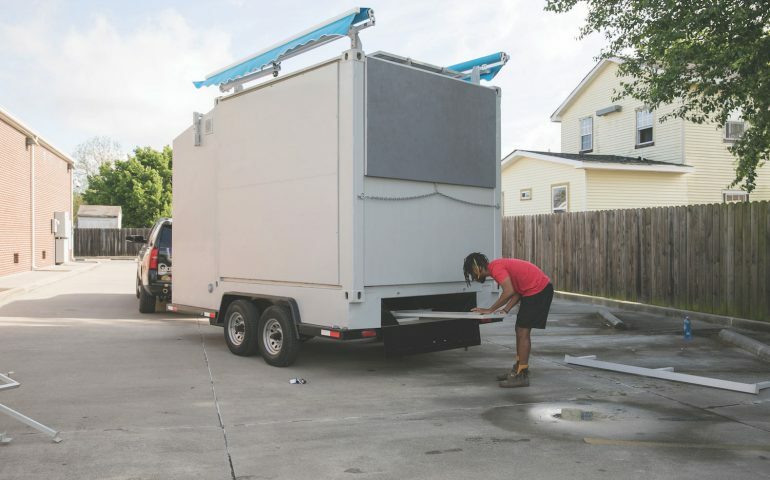 Mobile off-site museum experiences are emerging throughout the country, offering an encounter with works of art in unexpected locations, and energizing public perception of the role of art museums in the community. Building on the success of NOMA’s much beloved “Van Go” program, a van-based mobile classroom active from 1987 to 2005, NOMA+ represents the next generation of community outreach initiatives at the museum. “NOMA+ offers us the opportunity to expand the pop-up museum concept and adapt it for New Orleans. With its flexible design, NOMA+ is capable of delivering creative experiences at a variety of locations and events, impacting thousands of visitors each year,” said Susan Taylor, NOMA Director. Conceived by Taylor as an opportunity to reach every neighborhood in the metro area, NOMA+ was designed with New Orleans’ diverse communities in mind. The Tulane Small Center for Collaborative Design facilitated a series of community conversations, inviting key stakeholders and community partners to participate in the planning from the very beginning. David Thompson, a machinist who has been tinkering in metalworking shops since the age of 7, was tasked with transforming a 17 by 8 foot trailer into an engaging community art space. The Cowens have long been associated with education in the city. Dr. Cowen served as the president of Tulane University from 1998 to 2014. Nicolas Aziz was hired by NOMA as community outreach coordinator to introduce NOMA+ to the metro area. Aziz, a native New Orleanian, has initiated many of his own community-based creative projects in the past, including WriteBrained, a program that engages teenagers in creative writing, along with curating shows at galleries in New Orleans and creating his own performance-art productions. A graduate of Morehouse College, a historically black college in Atlanta, and the University of Manchester in England, Aziz says both experiences taught him how to bridge worlds that are often divided by class and race. The pop-up museum is completely solar-powered with foldout tables and retractable awnings, allowing for maximum use of outdoor space. The museum can be unfolded and set up by one staff member. NOMA+ will appear at community centers, libraries, NORD centers, marketplaces, churches, schools, and festivals, among other community institutions and events with the aim of reaching intergenerational audiences and demystifying the museum experience. Community curators from within New Orleans broader creative community will be invited to lead activations in coordination with NOMA’s educators. Read a blog by Nicolas Aziz about the launch of NOMA+. 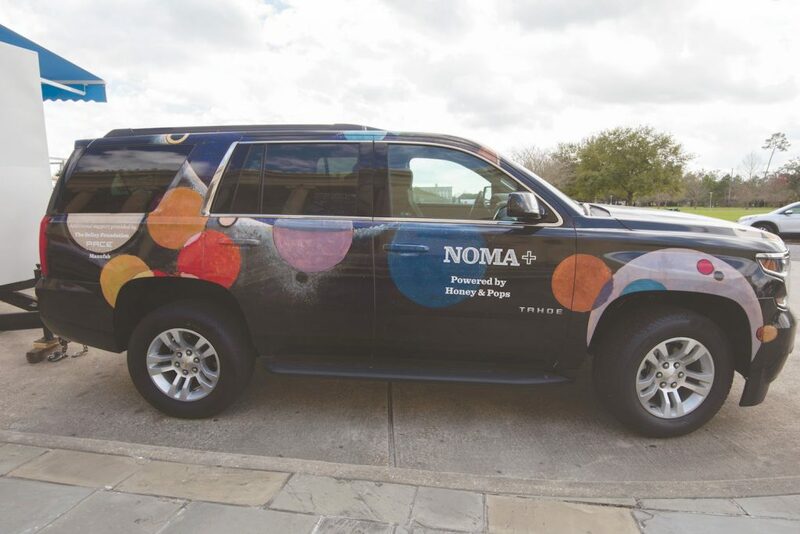 The Chevy Tahoe that pulls NOMA+ is decorated with circular patterns found in a Wassily Kandinsky painting from NOMA’s permanent collection. NOMA+ is contained within a trailer with platforms that unfold by way of a cable-winch system.